Starting out as a vestibular audiologist can be overwhelming. It usually involves setting aside much of what you learned in school to nose-dive into a sea of often complicated and confusing vestibular function tests. Each test has its own set of strict rules along with seemingly dozens of exceptions. Interpretation is rarely straightforward. Add to that the fact that the literature on vestibular function testing goes back over 100 years and contains many areas where there is little consensus among researchers. Speaking from personal experience, the idea of mastering the various tests felt like an insurmountable challenge when I was first starting out. The introduction of the video head impulse test (vHIT) to our clinic was a turning point for me. Finally, I had something I could learn from the very beginning instead of feeling like I was perpetually playing catch up! Plus, as one of the first clinical sites in Canada to purchase the system, I was also able to absorb new literature as it was released. My love for vHIT was born. I wish I could say that it was all smooth sailing from there. However, starting out early with vHIT also meant that we had very little to draw from when we encountered unusual tracings and results. The learning curve was steep. It is my hope that, through this article, I can introduce the fundamentals to make the transition a bit easier for people who are just getting started. Let's test your VOR system out right now. Pick a point of interest somewhere in front of you and stare at it; perhaps it can even be a word in this sentence. Now, try rotating your head quickly back and forth while you continue to stare at that same point. Chances are, you were able to keep your chosen point of interest in focus, all thanks to your VOR. Think of your VOR like a car’s suspension system – your eye movements cancel out head rotations to keep everything stable. The ratio between the eye and head movements is known as gain. When calculated, the gain value should be very close to 1 in patients with normal VOR function (eye movement = head movement; Figure 1). Figure 1. Normal VOR function. When a VOR impairment is present, the eye movement will not be proportional to the head movement. Instead, the eyes will “come up short” of the target. As a result, a corrective eye movement, known as a corrective saccade, must be made to re-fixate the eyes back on the target (Figure 2). 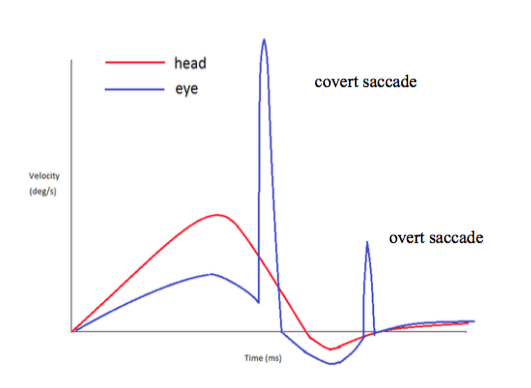 Corrective saccades are very transient (fast) eye movements. Corrective saccades that occur after the head rotation are called overt saccades. Corrective saccades that occur during the head rotation are called covert saccades. This distinction is important. Technically, head impulse testing can be done bedside by performing head impulses and observing the resultant eye movements. However, while overt saccades are often observable to the naked eye, covert saccades cannot be detected without the use of sophisticated equipment, such as the vHIT system. Figures 3 and 4 show illustrated examples of overt and covert saccades, respectively. Note that in both examples, the peak eye velocity is much lower than the peak head velocity, which would result in abnormally low gain. Figure 3. 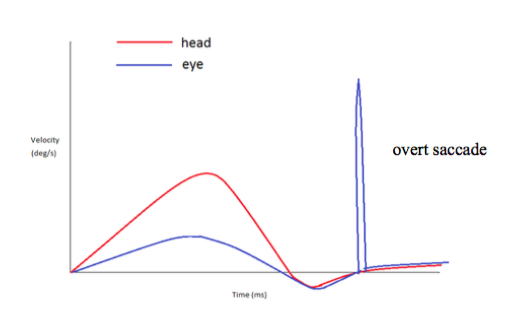 An example of a VOR deficit (low eye velocity relative to head velocity) followed by an overt saccade. Figure 4. An example of a VOR deficit followed by a covert (and small overt) saccade. Note that the covert saccade occurs while the head is still in motion. A gain value that is significantly lower than 1 is a strong indicator of VOR loss as it indicates that the eye movement was not proportional to the head movement. Patients with VOR loss may report visual blurring or jumping of the visual field during head movements. This is known as oscillopsia and it can be very debilitating. VOR loss can be unilateral or bilateral. Getting more technical, the eye movement that results from a given head rotation will be a vector of the excitatory and inhibitory inputs from the paired semicircular canals being stimulated. We have 3 semicircular canals (SCCs) in each ear that are arranged roughly orthogonal to one another (lateral, anterior, and posterior); all detect angular accelerations in their respectively planes and can be evaluated with vHIT. The left and right lateral canals are paired. The left anterior canal is paired with the right posterior canal (LARP) and the right anterior canal is paired with the left posterior canal (LARP). The anterior and posterior canals are sometimes referred to as the vertical canals. Still with me? This all means that when you rotate your head directly to the right, you are stimulating the right lateral SCC and inhibiting the left one. That information will be combined to determine what the resultant eye movement will be. When a VOR loss is present, the eye movement will not be proportional to the velocity of the head rotation, resulting in reduced gain and corrective saccades. In this example, the presence of a VOR loss would suggest a problem with the right lateral SCC and/or right superior vestibular nerve. A similar pattern occurs when you rotate your head in the vertical planes. If you are wondering how to picture the planes of the vertical canal, my very clever audiology mentor (shout out to Maxine Armstrong!) once pointed out that the planes of the vertical canals are similar to the classic head movements made famous in A Night at the Roxbury. She was very correct. The following GIF will show you what she was getting at – it shows stimulation of the left anterior followed by the right posterior canals. Incidentally, this is probably the first time a GIF has been featured in Canadian Audiologist. Maybe that’s for the best. I’ll move on. Some of you might be wondering at this point what all the fuss is about when it comes to the vHIT. After all, doesn't the caloric test also measure the VOR? Despite some parallels between the two tests, the short answer is a big NO. Unlike vHIT, the caloric test assesses the lateral canals and superior vestibular nerve only and cannot be used to assess the vertical canals or the inferior branch of the vestibular nerve. Caloric test results are also not particularly sensitive to bilateral losses, which tend to be the most debilitating for patients (and easy to dismiss as normal since true vertigo and nystagmus will often be absent as symptoms). Moreover, the caloric response is aphysiologic and its actual mechanism is still poorly understood. The caloric stimulus also forces us to make our already dizzy patients even more dizzy. Though most tolerate the test well, it still causes discomfort and distress in some patients. Despite all of this, I still believe the caloric test has a place in the standard vestibular test battery. At our clinic, we find that the clinical picture we get from both of the tests together is clearer than either test individually. With that being said, if I was ever forced to choose between the two, I’d choose vHIT in a heartbeat. How Do vHIT Systems Work? Most vHIT systems are comprised of ultra-lightweight goggles imbedded with a camera capable of high frame rates (for capturing eye movement) and an accelerometer/gyroscope (for capturing head movement). During data collection, several head impulses are collected. The resultant tracings allow the clinician to compare the eye and head movement data to look for signs of VOR loss. Gain values are also calculated automatically through the software. Typically, the patient is positioned at least 1 metre (or at a fixed distance) from the intended target. Once the goggles are securely in place, a calibration is performed. Before starting the head impulses, the patient should be instructed to stare at a target positioned at eye level while relaxing his/her neck. The patient should be asked not to anticipate the movements and to avoid blinking. The examiner should continually monitor the live video to confirm that the pupil is being tracked accurately. Each of the paired SCCs (lateral, LARP, and RALP) have to be tested separately. Tutorials on correct technique are often provided by the manufacturer with the purchase of a system, though many of those tutorials (and others) are also posted on YouTube. A good set-up is half the battle and will streamline the process of interpretation. The goggle strap needs to be tight. If the patient cannot tolerate the goggles being tight, you should probably not continue the test (unless you are very experienced with interpretation). The risk of misleading tracings is too high. Grip the patient’s head firmly. For the lateral canals, imagine you are holding a basketball from the top and you don’t want it to fall to the ground. Similarly, for the vertical canals, one of your hands should be positioned firmly under the patient's chin (but not too close to the throat). This will feel very unusual at first but it doesn’t actually feel strange for the patient. You will almost immediately see improvements in your tracings. The movement of the head should be a turn and stop. If you are starting from the centre, you should be stopping the head at approximately 10–20 degrees and holding it there for a moment. Those who are new to vHIT almost always try to bring the head back to centre just as quickly as the initial outward rotation. This pattern is usually (thankfully) rejected by the software outright. Small details matter with vHIT. Make sure to follow manufacturer instructions with how to position the goggles. Don't touch the goggle straps during head impulses. With the exception of your first few weeks of testing, develop a low tolerance for noise and artifact (e.g., from blinking, goggle slip). With experience, you should be able to recognize and eliminate sources of artifact as you are testing. High gains and eye movements that occur before head movements are strong indicators of goggle slip. Try tightening the goggles or changing your hand position from the top of the head to cradling of the jaw. A hair tie may help for those with long hair, especially if it is very shiny. Excessive blinking can throw off your results. Most patients will let you gently tape their eyelashes open with medical tape (this is a less barbaric process than it sounds). Thankfully, you can often avoid that step by encouraging the patient to open his/her eyes very widely. Not all tracings with corrective saccades are abnormal. Not all tracings with normal gains are normal. While an in-depth exploration of vHIT assessment and interpretation is beyond the scope of this article, remembering this detail will probably serve you well as you start interpreting tracings. As I move toward a conclusion, I'd first like to offer a word of caution: the quality of a vHIT assessment and interpretation can range quite dramatically. When you first start out, your results will improve significantly over a fairly short period of time as you adjust to the basic technique. Progressing beyond that stage takes a considerable amount of time and energy. I would encourage anyone looking to purchase a vHIT system to take the time to learn the intricacies of assessment and interpretation. Through the vHIT, we have found devastating levels of VOR loss in patients that had previously been told that there was nothing wrong with their vestibular system. I assure you, it will be well worth the effort. Meyer CH, Lasker AG, Robinson DA. The upper limit of human smooth pursuit velocity. Vision Research 1985;25(4):561–63.